Victoria Park AAC was formed in April 1930 and one of its first stars was the middle distance runner Jack Gifford. Born in Airdrie in 1915 he first appears as a good athlete at the SAAA Championships in 1932. He was the first club man to be noted in the results of the SAAA championships when, although unplaced, he won a standard medal for the Mile. His running was good enough for him to be asked to run in the invitation mile at the Rangers Sports in August where he was third behind Calderwood (Maryhill) and R Clarke (Plebeian). In winter 1932/33 he ran the first stage for the unplaced Victoria Park team in the Midland District relays and in the West District Championships at Hamilton he was second to JC Flockhart of Shettleston. Well don on Flockhart, he was fully 70 yards up on the third runner. He was absent from the team that ran in the National at the end of the winter season. After Blakely, it was Tom Riddell that he tested himself against. On 17th June at the Glasgow Police Sports he was second to Tom Riddell in the One Mile Invitation Handicap Running from 16 yards he was leading the great man in the back straight of the last lap when he was overtaken, finishing ten yards down at the tape. He was running well at just the right time – the SAAA championships were just one week later at Hampden Park. Gifford ran in the mile and was only beaten by Tom Riddell and Jackie Laidlaw. Riddell was well away and the comment was that Gifford had enhanced an already growing reputation – had Riddell been absent either of the others would have been a worthy champion. His time that day was 4 minutes 24 seconds. That winter he again ran the first stage of the team in the Midland relays and although he turned out in the District Championships he was outside the first ten and only his club’s second scoring runner. There was no Victoria Park team in the National cross-country championships but in January 1934 they had a team out in the eight stage Edinburgh to Glasgow relay for the first time. There was another first for Gifford – he ran the first stage for the club and was therefor the first Victoria Park runner ever to run in that wonderful event. He ran well enough to be fastest man on the stage – two seconds up on Ian Lapraik. In January 1935 Gifford again ran in the Edinburgh to Glasgow but this time on the tough sixth stage. It may be that the seven miles on the road was a bit much for a half-mile and mile specialist who never seems to have tackled even two miles on the track but he was over a minute slower than the fastest on the stage although he picked up one place. In the District Championship that year he was again second Victoria Park finisher when he was tenth although the team finished second and a silver medal was his. There was however no senior team, indeed no senior runner, from Victoria Park in the national championships at Hamilton. Summer 1935 saw the promising Gifford improve at both half-mile and mile. On Monday 20th May he was back at the Maryhill Harriers Sports at Ibrox where a competitive 880 yards he was timed at 1:57.7 from a handicap of only 8 yards. His next appearance was at the national SAAA championships at Hampden on 22nd June where he finished second to Tom Riddell but ahead of Donald Mclean of Maryhill Harriers in 4:34. Riddell won by 25 yards but second in the national championship was his best competitive race yet. The biggest race was yet to come: on 24th August 1935 he ran against the AAA for a Scottish team and finished fourth in the mile. In the ’35/’36 cross-country season, Gifford did not run in the District relays but he did run in the Midland District Championship – but for Bellahouston Harriers and not Victoria Park. Fifth in the individual race, he could not be counted for the team championship, his change of club had been too recent for that, but he would run and help win many a medal for Bellahouston before his running career was over. He was however ineligible to run as a team member in the National that year but running as an individual he was 17th. In the SAAA Western District v Atalanta match at the Glasgow University ground at Westerlands on Monday, 1st June he was timed at 4:33.0y for the Mile where he was second to Robert Graham. Hitherto known as a half- and one miler, Gifford stepped up a distance to race successfully at three miles on 6th June, 1936, at Hampden in the Queen’s Parl FC Sports Meeting at Hampden. He turned out in the individual and team race over the distance and won in 14:49.6. The report had a special paragraph on the event headed PERFORMANCE OF MERIT. It read: “The other performance of real merit was that of Jack Gifford of Bellahouston in the three miles. He beat JC Flockhart (Shettleston) in a great race by three yards in 14:49.6.” Other runners who finished behind him were Donald McLean, Emmet Farrell and TW Lamb. Gifford might not have been eligible for the cross-country season’s teams, but he could and did run in the club’s medley relay teams. On 20th June at Glasgow Police Sports a new Scottish medley relay record was set by the Bellahouston Harriers team of Gifford, Bone, Young and France. The Glasgow Herald reported: There was one performance of the gathering demanding minute reference and that was the win of Bellahouston Harriers in the one mile medley relay race, which they won in the new Scottish record time of 3:34.2, 0.2 faster than the time put up by Glasgow University at the same sports four years ago. It was half miler Jack Gifford who really did much to help Bellahouston achieve this performance. He went round the half-mile at the heels of Robert Graham, always appearing to have an abundance of pace, while it seemed that the joint mile record holder (whose record was broken by SC Wooderson in Saturday’s Southern Championships), was in front trying hard to get clear of Gifford, but the latter refused to be shaken off and became the challenger-in-chief, with the result that Bellahouston enjoyed the slight advantage of a change-over so close was the struggle; and the time for the half was 1:58.2, the sign of a record in the making. ” The remainder of the team – G Young, J Bone and Charlie France – all did their bit and the race was won and a record set at 3.34.2. 1937 Edinburgh to Glasgow Relay race start. On 30th November, 1936, Gifford ran the second fastest time of the day to see the team finish second. In the District championships proper, he finished fifth although the team was out of the medals. Came the national and he was twenty eighth for the team that finished eighth. The Edinburgh to Glasgow relay was a bit later in 1937, being run on 3rd April, 1937, instead of January as in previous years. It was a more successful team outing and Gifford ran on the last stage where he pulled up one place for Bellahouston Harriers to finish in third and win him a bronze medal. Wednesday, 12 May, 1937 was right in the middle of coronation celebrations which included athletics meetings in both Glasgow and Edinburgh. Gifford ran in the Hampden Park event and won the Three Miles in 14:44.4. The pace was made mainly by JC Flockhart and he and Emmet Farrell led into the home straight but neither could sustain a finish and Gifford won fairly easily. On 25th May in the Maryhill Harriers Monday evening sports he ran in the Two Miles but the handicapping was so ferocious that he was not in the first three but it was nevertheless another hard run for him. Given the successes of the Bellahouston Harriers relay team it was not a surprise that they were invited to, and duly won, the invitation six lap relay at the Monkland Sports at Coatbridge with Gifford part of the team that, and this is a quote, “won easily”. The annual SAAA West District v Atalanta was held on 1st June, 1937, at Westerlands, and Gifford was second to Robert Graham of Maryhill in a race won only by inches. The races were coming thick and fast and on Wednesday 15th June Gifford ran in two races at the one meeting. He won the mile in 4:13.1 (a new record time) by ten yards and then won the three miles in 15:17.6 by 40 yards from Adam McLean of Glenpark Harriers. The big one was the SAAA championships at Hampden on 26th June and this year, Gifford passed up the opportunity for individual gold in favour of relay gold. The Bellahouston medley relay team of Gifford, Murdoch, Smith and France retained the title in a time of 3:41.2 from Springburn Harriers and Maryhill Harriers. The winning margin was 15 yards. A week later, 3rd July, the relay team took part in and won the invitation relay at Ardeer Recreation Club’s sports meeting at Stevenston with a quartet of Gifford, Smith, Nisbet and France and “were never in danger of defeat.” And that was the end of the season for a successful Bellahouston team – and for Gifford too. The Midland District Relays of season 1937/38 were held at Garscadden in the West End of Glasgow. Jack Gifford ran first stage for Bellahouston Harriers but at the end of the race was, not in top times although the team finished third. When it came to the District Championships however, the club won the event with Gifford back in 14th place of more than 200 starters. Unfortunately when it came to the National, Bellahouston were third team but there was no Gifford in the team. The Edinburgh to Glasgow relay took place on 9th April and Gifford ran on the first stage where he was third for the team which won the race. Into the summer and the Monkland Sports were held on 26th May in 1938. There was a medley relay there in which the team (Gifford, Bell, Murdoch and France) was surprisingly beaten back into third place behind Springburn Harriers and Glasgow University. It was a good team and the defeat must have hurt the national champions and record holders. They put this right at the Babcock & Wilcox Sports at Renfrew on 11th June when they won the event from Springburn with a team of Gifford, Smith, Thomson and France. Hard on the heels of the Babcock Sports, two days later in fact on Monday 13th, he won the half mile at the Renfrew CC Association Track Championships on the previous night in 2:00.6. A week later, 18th June, at the Glasgow Police Sports at Hampden Park, Bellahouston did not only win the relay, but set a new Scottish record for the event. Gifford ran a most impressive first leg in 1:56.4 defeating international runners Graham and Carstairs. The new relay record was 3:32.9 and it was the club’s third title win in three years. This time the team was Gifford, Murdoch, Smith and France. The athletes were back at Hampden for the SAAA championships the following week and Gifford was out in the Mile. The report read: Until the last lap of the Mile, many of the spectators thought that young Jack Gifford, Bellahouston, would menace R Graham’s prospects of retaining his title, but it was obvious that Graham, in the lead and confident enough to remain there, had something in reserve, and when the champion did make his effort, he drew clear steadily and won by five yards.” Gifford’s time was a reasonable 4:28.0 to Graham’s 4:27.6. Gifford was out running for Scotland again on 23 July 1938 in Dublin in a match against England and Ireland. The Scottish team were really outclassed on the day but Gifford ran well enough to finish second of the six runners in the Mile in a time of 4:22.0. He was eight yards behind CJ Emery of England (the international cross-country champion) and ahead of team mate PJ Allwell. It was a fitting way to bring down the curtain on a very good season. In the District relays that winter he ran on the third stage for the Bellahouston Harriers A team which finished third. The club’s second team was fifth which was a bit of a warning for the others with longer races coming up. For instance the winners, Maryhill, could only field one team and Shettleston Harriers, running on their own turf, were second and twellfth. Unfortunately appearances are sometimes misleading – the District title went to the Victoria Park team with their first six runners in the top 20 finishers. Incidentally the individual winner was Jim Morton who went on to be SCCU president and manager of the Scottish cross-country team for several years after the war. This relatively poor performance must have spurred the Bellahouston team on for they won the National at the end of the year with six men in the first 30 of the field of almost 200 runners. But Gifford did not appear on the team sheet that time. Nor was he in the club team that was second in the Edinburgh to Glasgow relay on 22nd April. 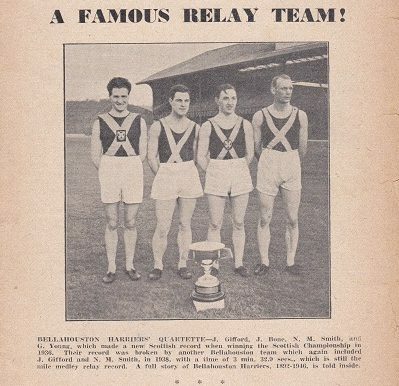 The Bellahouston squad won the SAAA Medley Relay title again at the national championships at Hampden Park on 23rd June, 1939 which meant that they had won it four years in succession. The winning team was Gifford, Murdoch, Bone and France and the beat Springburn by 30 yards in a time of 3 min 37.3 sec. They were so far ahead of any team in the country at the time that, had the war not intervened, they might have set a record for the number of wins. Gifford’s first individual victory was on 27th June in the Glasgow Transport Sports at Helenvale Park where he won the invitation 1000y in 2:12.8 off 16 yards. There was a medley relay which Bellahouston won without calling on Gifford’s services. The Transport Sports was a fixture that many did not want to miss – the narrow Helenvale track was known as a good one and many fast times were recorded there up into the 1960’s when they stopped holding meetings there. He may have missed the Helenvale relay but he was back at Ardeer with his team mates on 8th July for that one and the squad of Gifford, Thomson, Nisbet and France was too good for Maryhill, with a time of 3 min 46 sec. The Rangers Sports on 5th August had many very good international athletes in action and Gifford ran in the 1000y off a handicap of 20 yards where he finished second to G Sears of Kent Beagles who won in 2 min 10 sec. Gifford was only half a yard down at the finish. His season was brought to a close at the Cowal Highland Gathering on 26th August, where he ran the opening leg in the relay. Given a lead on the opening leg by Gifford they were ‘sound winners’ in the good time of 3 min 39 sec. The team of Gifford, Wilson, Bone and France was too good for Springburn Harriers who were only five yards adrift at the tape. Alex Wilson tells us that after the War started, he continued to do club runs and compete sporadically . On 14th July 1945 he won the mile handicap at Milburn Park, Alexandria, in the Vale of Leven District Sports in 4:28.2 off 45 yards. That equates to about 4:36 for the full mile, so he was still in good shape. There had been several medley relay races that year but the top teams were Victoria Park AAC and Garscube Harriers – the great Bellahouston teams had been broken up and it would be some time before they were again winning national titles. Victoria Park won every relay they contested and in August alone they won three relays including one against an SAAA Select at Lennoxtown at the end of the month. Gifford may have been running well but he did not appear in any more prize lists for the rest of 1945. Like so many others, his career as a runner was blighted by the war which came as he was running very well and his best years were taken from him. He had been a very good athlete with a fair range of ability: 880 yards to three miles on the track, fastest times on stages of the Edinburgh to Glasgow road relay, and team and individual medals over the country. His individual medals and achievements should not be forgotten in favour of his relay achievements.